George B. Crittenden (1812-80), Major General, CSA (KY). Brother of General Thomas L. Crittenden, USA. Participated at Fishing Creek. Resigned. Mounting residue verso, otherwise fine. 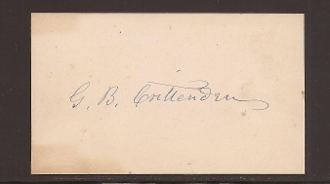 Scarce autograph.